Re: Did Hawkslayer get retconned? Hawkslayer did carry the Strifespear, but he was killed by Tarjan when he tried to enter Malefia alone. Your party finds his body as soon as you enter, and takes it the rest of the way without Hawkslayer. Not sure why they changed mithril to mothren and adamant to adamast. Could be a Scottish word, or it could be that those are copyrighted words. What's the old and new reference you think is retconned? Hawkslayer was given the strifespear in Tarmitia, and you have to retrieve it in Malefia. ahhhhh - I think that would be a bug. He's mentioned by Alguin, if I recall as "killing Tarjan with the legendary Stfifespear", which needless to say, is incorrect. I would totally take this as how the legend was passed down. 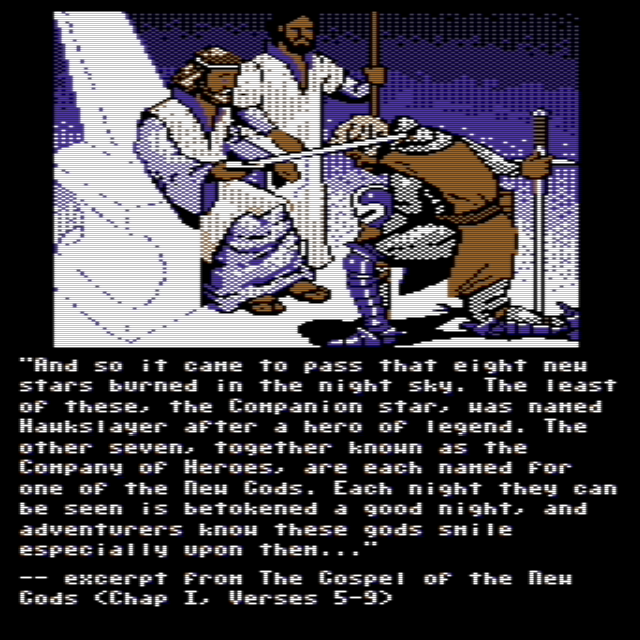 According to Bard's Tale 3, the legend was passed down in the "Gospel of the New Gods", with the Seven Stars each named after the New Gods - the heroes who defeated Tarjan. How often do people forget the name of stars? There are even relatively minor characters, like Tslotha mentioned in the game and in some cases they know an awful lot of specifics about the past events, so again it is highly unlikely they would just forget the New Gods. Also, 150 years is how many generations for elves and dwarves again? Or besides dwarves becoming blue, taller, and beardless and elves becoming ugly, have they also lost their longevity? Either way, it's pointless to deny that there are big retcons all over the place. Another point against it - this is the game intro, a meta-narrative that sets the environment, the story you're about to enter into. As opposed to an NPC recanting that character's knowledge within the game world. Also, 150 years is how many generations for elves and dwarves again? Judging by the novella Paladin, potentially less than one, at least for dwarves. "Imbecilic kit," Lwyd [a Dwarf] shouted back. "You've a rabbit's brief life compared to mine." Keep meaning to reply to this one: there was no retconning of Hawkslayer. What happened in the game happened in the game. This definitely falls under the category of "legend variant" where Hawkslayer and the Strifespear were known to be with the party, and that got extrapolated out to them being present in the final conflict. And it also got extrapolated out to them as "Hawkslayer gifting the legendary Strifespear to Skara Brae", despite him being dead by then, killed by Tarjan. So yeah, Hawkslayer killing Tarjan is a pretty big retcon, given the fact, that it was actually the other way around. Whose to say that the legendary staff being left behind is not seen as it being gift by Hawkslayer? If Hawkslayer is extrapolated into the legend of the battle against Tarjan, it would stand to reason that the legend would include him going off in the same way as the other heroes, and if he left his spear behind, it could be seen as he left it behind as a gift. Can't claim copyright on a word, only a trademark. But yes, that's the likely reason. Mithril is a JRR Tolkien invention. D&D renamed its Hobbits to Halflings because of legal threats from the Tolkien estate. Adamant is generic though.